This is an artistic study of the 75ch value in the Bhutan 60th Anniversary of World Scouting issue. 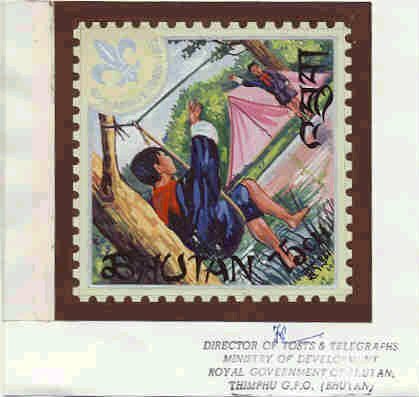 The stamp was issued on November 30, 1971. The artist was Heraclio Fournier but this study is signed by Director of Posts and Telegraphs, Bhutan. The design features a Scout crossing a stream to camp using a rope seat bridge.